Tall Scientist: Are we having any fun? 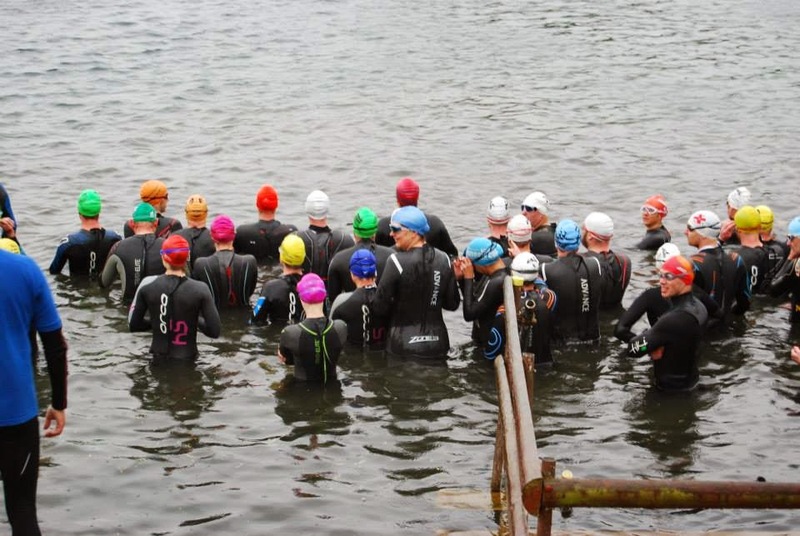 I'd decided that this year was going to be the year I went for an Olympic distance triathlon. In order to work myself up to this particular crazy feat I felt like I should do a couple of sprint distances to start off with. My last triathlon of last year was Leybourne. So it was due to be my first of 2014. I'd chosen it again as I knew it was a nice mostly flat course that would be a good start to my year. Leybourne lakes lie near Maidstone in Kent and are where we go to train for open water swims. The water is clean but very murky at this time of year. 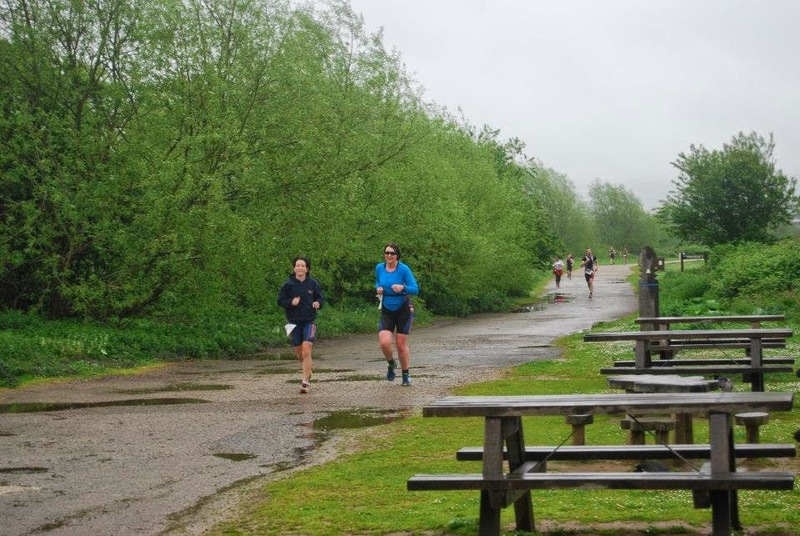 I'd gone down to the lake a couple of times before the race to get myself acclimatised to the temperature - a shocking 11.5 degrees on my first trip out, enough to make me seriously consider running out of the water again, but didn't as I had people watching me! I was very grateful for those practice swims as it meant I was used to the distance and the temperature before I started. The day started as it meant to go on for the next couple of hours. Rain, cold and miserable! I picked up Nadja and Jennice on the way to the race and unfortunately got caught in a bit of traffic on our way to the lake. This meant we were one of the last to rack up and I didn't get a chance to grab my favourite area next to prop spaces. Didn't really seem to affect me much really. As it was so cold the difference between the air and the water (which had now risen to the heights of 13.5 degrees) wasn't so bad. They'd also managed to get some timing chips so we didn't have to shout our number out to someone. We were set off in the water. At every buoy I turned to look and figured I wasn't at the back, which was good. I also missed the sunken car which I know is there on the way back in but had still given me a fright the first time I'd gone out. Waiting for the off - I'm the tall one right in the centre with the blue cap on. On your way out of the water the Leybourne race gives you a real help I've never seen anywhere else: they unzip your wetsuit and pull one shoulder down. Brilliant for transition! I ran to my bike and sorted myself out, teeth chattering. I even put a long sleeved top on to try to keep me warm. Out on the bike course it was chucking it down. This was not helped by the giant lorries and trucks spraying water over us as we went round the course. My top got soaked and so did the rest of me. As I came around the first time I recognised a familiar plait and as I passed Jennice I said, Are we having fun yet? We had a fun few minutes jostling for position before I managed to pull away from her, then I managed to manoeuvre round a lorry and get round the roundabout for the second lap, I could see her still stuck behind it. I guess that's where commuting into town and back really has its advantages! Coming back into transition I couldn't really feel my quads or even my feet. I was numb from the cold. There was even a volunteer offering to help unclip our helmets! I soldiered on John Wayne style and started out on the run, conscious that Jennice might catch me at any moment. About five minutes into the run I realised I must have picked up a stone in my shoe in transition and if I didn't take it out I'd get a blister. So I had to stop to sort my shoe out. It had almost stopped raining, but because it was cold my glasses had steamed up - I couldn't figure out whether it was worse with or without them! Near the end of the first lap Debbie came up the track having finished her race. I called her a few choice words for finishing already but she kept pace with me and let me know that Jennice hadn't passed me yet. She also geed me on by saying I was running really well and to keep going at the same pace for the second lap. Thanks Debbie. Having gone past everyone cheering me on for my second lap, I dug in and tried to keep at the same pace. It was quite lonely for the second loop given most had finished by that stage so I spent most of it trying to decide what my Strava title would be and whether my glasses were helping or hindering my run, as well as trying to avoid the odd dog and pedestrian. I also saw a lady with a fluorescent jacket who I mistakenly thought might be Jennice on her first lap. Finally I got to the end and I simply didn't have anything left to sprint finish. I ended up doing a time of 1:42, which is pretty much the same as last September, which I was a bit disappointed with given the training I've done. Looking at my splits it looks like the bike was slower - probably due to the weather - and I made up the time in the run leg, which is great. Jennice never did pass me to my surprise and she came in a couple of minutes later running the last few metres with her daughter which was really sweet!